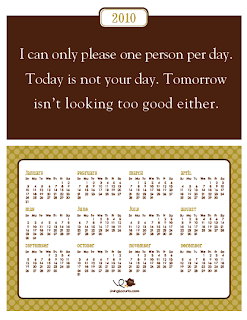 I have seen this saying and love it...what a great calender and you can download it over at Living Locurto. I must admit to be slack when it comes to the quilting stage. I get the top done and then I stop. I don't have a big long arm machine and find it so hard to quilt on my domestic machine. I know people do it....but I only seem to be able to stitch in the ditch. 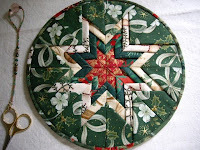 Anyway...I just came across this tutorial explaining how to join your quilted blocks together which made it seem so easy. Take a look at what Leah Day has to say about joining them. 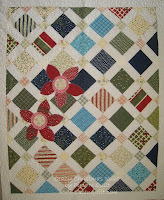 Tea Rose has a lovely Modern Garden Quilt tutorial using charm squares. Looks easy enough to whip up and lovely and modern and fresh. Sachiko also has a nice easy nine patch quilt you can use your scrappy fabrics or scrappy strips up on. Well the season for cooking is with us and I just came across the Michael Miller Making it Fun blog with a pattern for the classic apron....nice and simple too. Take a look though as there are a heap of patterns on the sidebar over there. 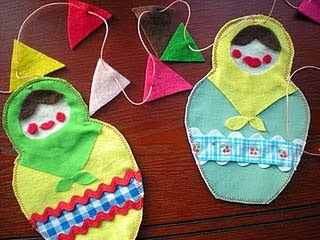 Krista from Look Ma No Patterns has a really sweet garland of nesting dolls she is sharing with us. 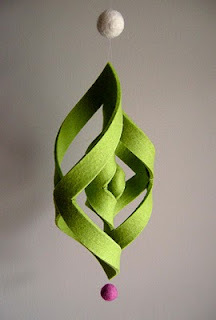 These would be nice on their own for a Christmas tree ornie too. She also has a Christmas Stocking, apron made from tea towels and other tutorials she is sharing with us. 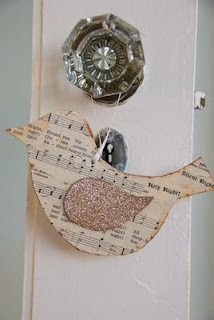 Living the Swell Life have a super simple birdie ornament to make using paper and modge podge. 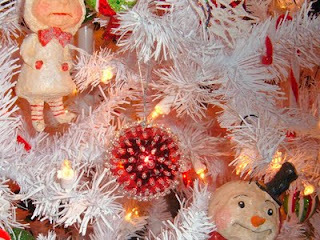 Lola Again has a super simple Christmas Ornament tutorial made from a Styrofoam ball and sequins...these would be nice and easy to whip up. 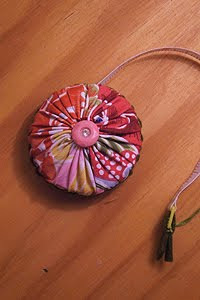 Over at Write It Down there is another tutorial of Jana's aka Lola for some button wreaths....these look really simple and easy to make up too. 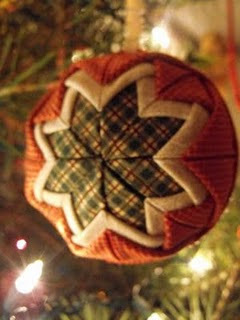 Susan at Hanging On by a Needle and Thread has posted this great video tutorial for a Christmas Ornament using a Styrofoam ball and some pins and fabric, I thought it was really lovely. 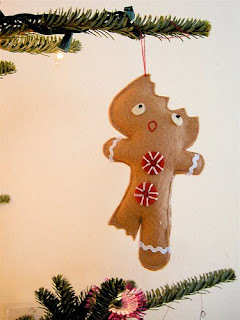 Betz white has a tutorial for this felt ornament - something quite different - she calls it a "felt snowflake"
Elsie Marley had a really cute half eaten gingerbread man pattern to make for the Christmas tree....don't you just love it. 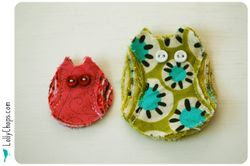 Juicy Bits is sharing her owl tutorial.....gotta love these owls. 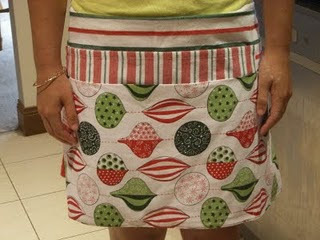 Dawnie from Itching for Stitching has an easy tutorial to make an apron using three brought tea towels....and being the right season it is Christmas themed tea towels. But of course you can use any theme tea towel you wish. 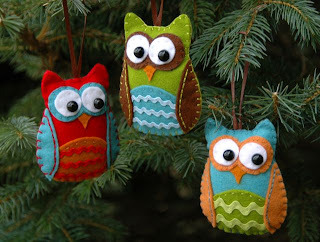 Lolly Chops is in on the owl frenzie and has a cute little owl you could use them as she has to make a brooch or just hang them as an ornament. Okay this is a must try. This tape measure cover is a cutie with the yo yo top. 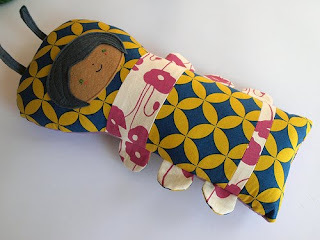 Rebecca from Blinking Flights has a bug softie pattern that would be a nice and easy softie to whip up for the kids for Christmas pressies. I think these are really cute for the littlies. 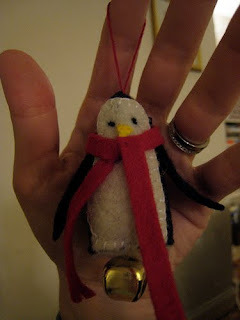 This is the cutest penguin ornament over at Belle Epoque's. Now I am an owl lover but I think penguins have to come very close second. Belle Epoque have a tutorial for a Bias Tape Tote that looks easy enough to make up. I probably would make my own bias binding though and make it a bit thicker. 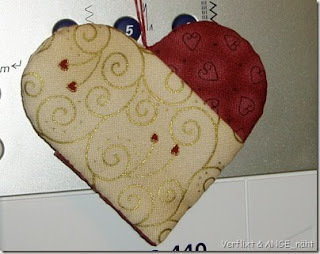 Angelika has a tutorial for a folded heart ornament...a nice easy effective way to make a heart shaped ornament. It is in German but with Google Translate there is no problem understanding it. 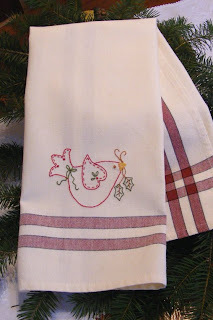 Bird Brain Designs as another stitchery for Christmas called Holiday Dove. A lovely little stitchery that can be used on lots of things. 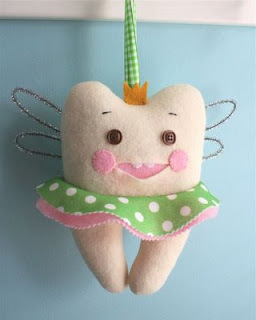 mmmcrafts has such a cute tooth fairy pillow that she is sharing with us. What a lovely pillow for your children to save their "tooty pegs" in...for the little boys there is the Tooth Officer. 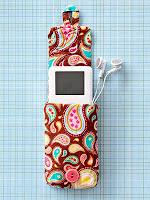 Better Homes and Gardens have a pattern to make an ipod holder/case. It has a loop on the back you can attach a metal dog clip to hang it off your bag, belt or pocket. 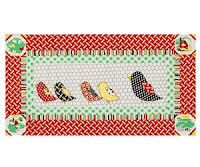 Better Homes and Gardens have a cute chicken quilt called Chickens in the Coop....could use it on the table or as a wall hanging. 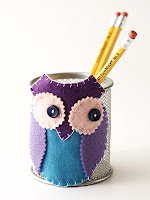 A quick easy way to decorate a plain pencil holder...and what better way then with an owl. Better Homes and Garden have the pattern here. 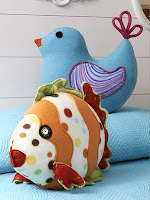 Better Homes and Gardens have some cute fleece soft toy patterns to grab here. 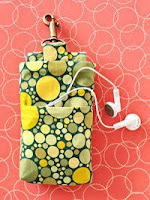 Chimera Threads is sharing a patchwork bag pattern. She uses charm squares to make this up. Mama's Little Monkeys has a nifty idea to recycle crayons. Great idea for all those little bits of left over crayons. OMG how cute is this sock bat over at Heather Bailey's....why didn't I find this sooner for Halloween....but hey, its too cute just for Halloween anyway. Mrs Moen has a tutorial showing how she uses crayons to colour in your stitcheries. Pinwheel Ponders had a great paper pieced Santa ornie to share with us. 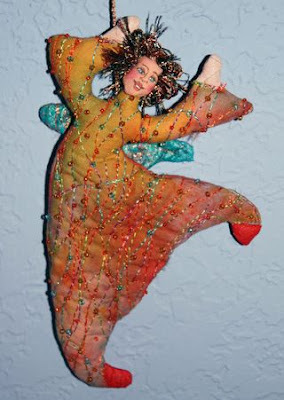 Gosh there are so many things around blogland I will never ever have enough years in my life time to do them all...but once again, this is another on my list....lol....drop over to my Sew Prim Khris blog and have a look at ones I whipped up...they really are easy and fun to make. Piece N Quilt have a tutorial for a simple charm square Crazy Christmas quilt I really like.....gosh, I really need to make another quilt...one day. 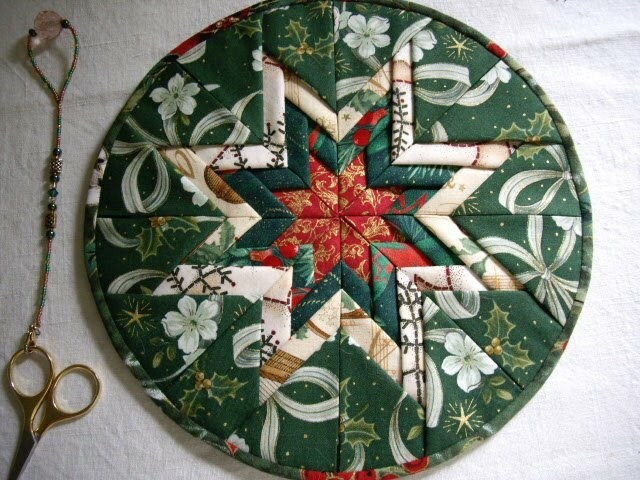 There are a heap of other tutorials over there I like too...like the Figgy Christmas quilt....very nice indeed. 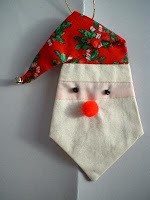 Christmas tree napkins are a great idea to decorate your table for Christmas this year. Drop over to Craft Sanity and check these out. 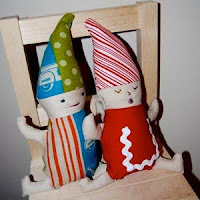 Make Baby Stuff has a tutorial for a cute little Elf softie. I think this is a real cutie for the babies and kids. 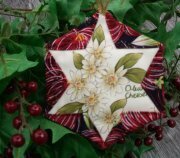 Jennifer from Bronze Wombat has an amazing folded star patchwork tutorial. 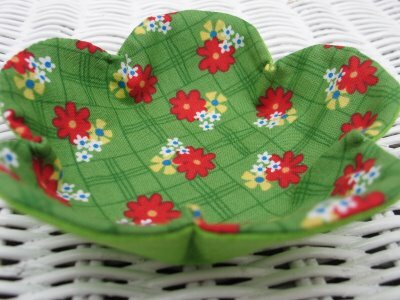 You could use this as a trivet, pot holder, coaster or centre piece. Something I will have to try at some stage. 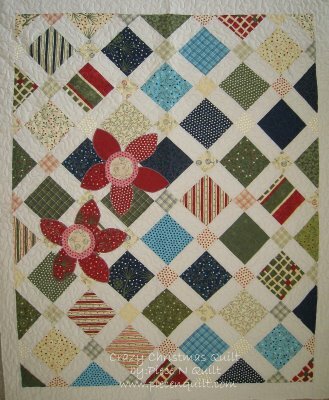 Kiwi Quilts has some great ideas using hexagons. I really like the hexagon star ornament, but take a look and see the other great freebies she has. Poppy Lane has a very easy fabric bowl to make. Would be cute in Christmas colours with some candy bonbons in it.